"Earth-eating, or geophagy, is a well-documented phenomenon. Many species of mammals, birds, reptiles, and even insects, in all parts of the world, eat dirt. In the animal world, parrots seek out particular clays and deer lick hollows into patches of soil, traveling long distances to reach these tasty spots. Cattle will chew on clods of particular earths; in South Africa, cattle will often be found meditatively licking away at termite nests, hollowing out polished scoops in any weak spots. Termite nests are rich in trace elements, as these "white ants" carry up fragments from as much as a hundred feet down." Geophagy (earth-eating) has long been assumed to be an attempt to rectify mineral deficiencies in an animal or person's diet. However new evidence suggests that this cannot always be the case. It has become apparent that the clay content is often the most important ingredient of selected soils. Clay is an effective binding agent as its chemical structure allows other chemicals to bond with it and so lose their reactivity. Clay is therefore an effective deactivator of toxins from diet or pathogens. Clay is the primary ingredient of kaolin and kaopectate that we use when suffering from gastrointestinal malaise. A very interesting report done by Discover magazine on Geophagy, or eating dirt. "Since most humans consume more plant food than meat, it should come as no surprise that geophagy (from the Greek roots geo for 'earth' and phagein for 'eat') is also widespread in peasant communities on all continents, with descriptions going back to Roman times. In such communities, pregnant and lactating women especially crave soil, typically consuming one-and-a-half ounces or more per day." The practice of eating clay is widespread amongst both humans and animals. In this video, you will see animals instinctively eating clay in the wild. Clay is a staple food in the diets of many different species of mammals. No one forces these wild animals to eat clay - they do it because it just makes them feel better. Many of the foods that animals consume, such as leaves and seeds, contain toxins and poisons that can cause upset stomachs, digestive problems, and even death for a wide variety of them. To neutralise and buffer the toxins that animals ingest, they instinctively know to eat clay regularly. For elephants, monkeys, parrots, buffalo, and deer, clay is a lifesaving substance, and they will travel vast distances, risking their lives to obtain it. We Eat Clay " And wear it too !" "Deep in the rain forests of New Guinea, Jared Diamond was surprised to see parrots, pigeons and crows fly down to a new landslide of earth and eat the bare dirt. 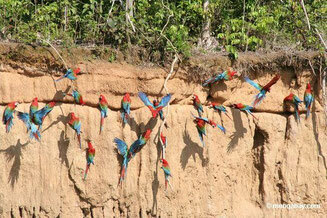 The birds flocked to this rare opportunity to access bare earth in an area densely covered with vegetation. Not all of the observed 140 bird species came down to eat earth. Only the eight herbivorous species that regularly ate fruit, seeds and flowers. Plants naturally contain numerous toxins that protect them from predators and pathogens. When the landslide soils were analysed they were found to contain less minerals than the surrounding top soil but again the clay content was high and, what is more, found to be more effective at binding alkaloids and tannins than pure pharmaceutical kaolinite. These birds were taking advantage of newly disturbed earth and selecting soil of just the right properties to bind and deactivate plant toxins." [Diamond,J 1998 Eat Dirt: in the competition between parrots and fruit trees, it's the winners who bite the dust. Discover. 19(2) pp70-76. ].